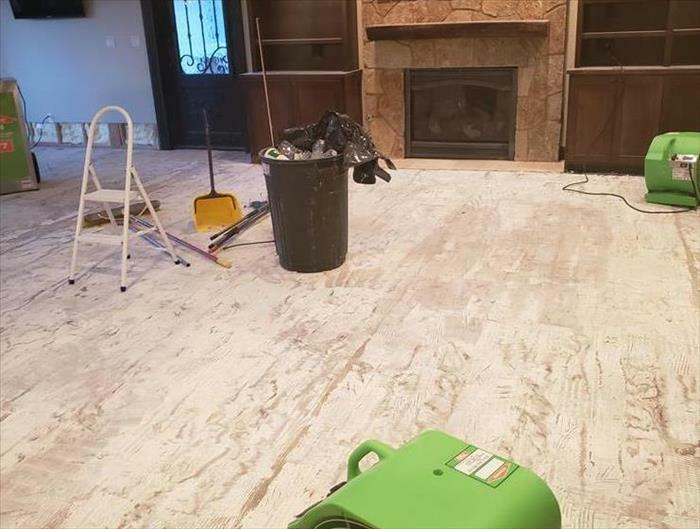 This Central Texas home was in an area of severe flooding so when SERVPRO® of Greater Waco was called to help, we had our work cut out for us. 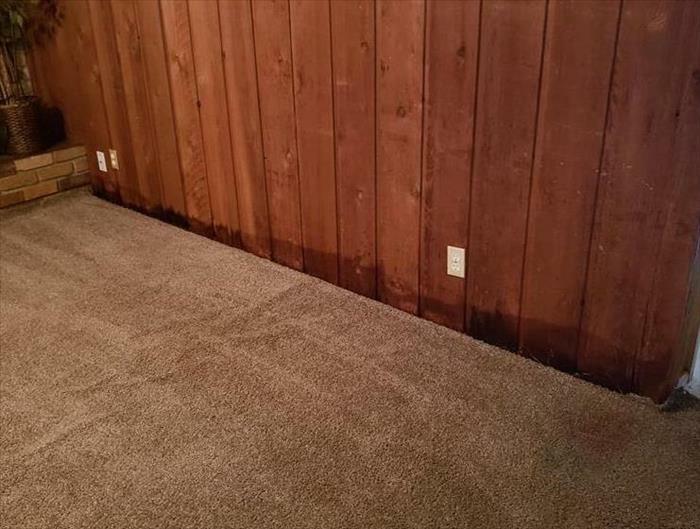 We routinely cut the walls to remove the wet drywall and insulation where the water has risen to highest level and as you can see in the picture, the water levels rose pretty high when it flooded this home. All of the affected drywall, insulation, flooring and unsalvageable items had to be removed due to having come in contact with the floodwater. Once demolition was complete, the areas were then thoroughly sprayed with an anti-microbial to deter mold growth. Recent storms in Central Texas caused the roof on this commercial building to lift up and allow water to flood down into its walls. In some areas you could very plainly see the water coming in from above but using our thermal-imaging camera we were able to see where even more moisture was located to the unseen eye (identified by the dark purple coloring in the image above). Once we made a complete assessment of the affected areas, we placed the required drying equipment and took daily monitor readings to ensure that the humidity levels in the building were decreasing until completely dry. It's happened to all of us. A moment of absentmindedness, busy schedule and managing several tasks that allows for disaster to strike. This picture is an example of just that. The tenants of this Central Texas home stepped away from their stove just long enough for a grease fire to begin. 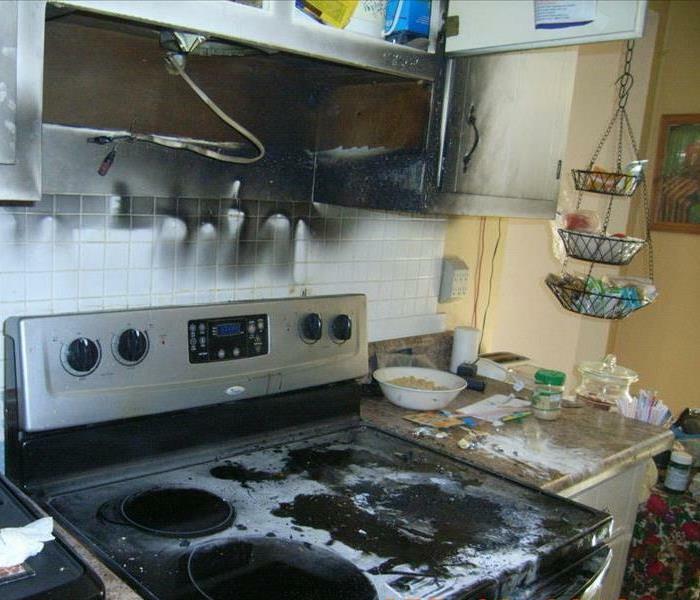 The stovetop, range hood, cabinets and were all damaged due to the flames. The house smelled of burnt material and soot covered the walls, cabinets and ceilings nearby. 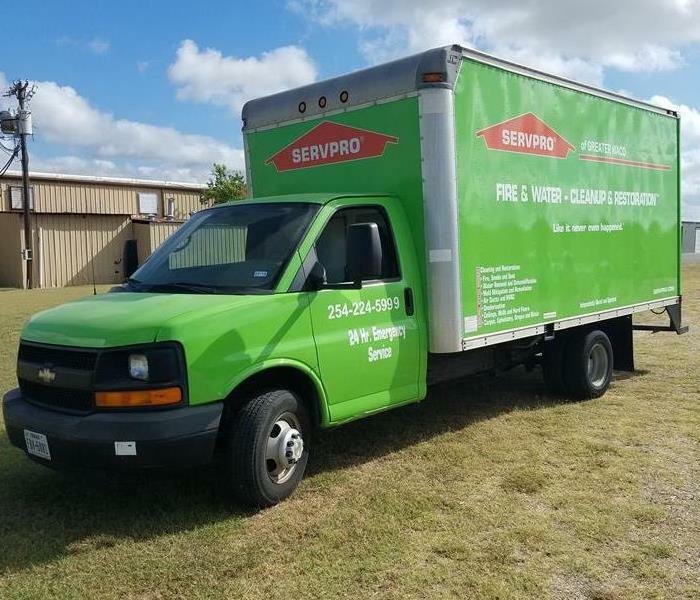 SERVPRO® of Greater Waco was there to thoroughly clean all salvageable areas of the fire damage, deodorize the home and help this family recover their kitchen area as soon as possible. This is an image where a water heater fire ignited and left disastrous results in this Waco home. 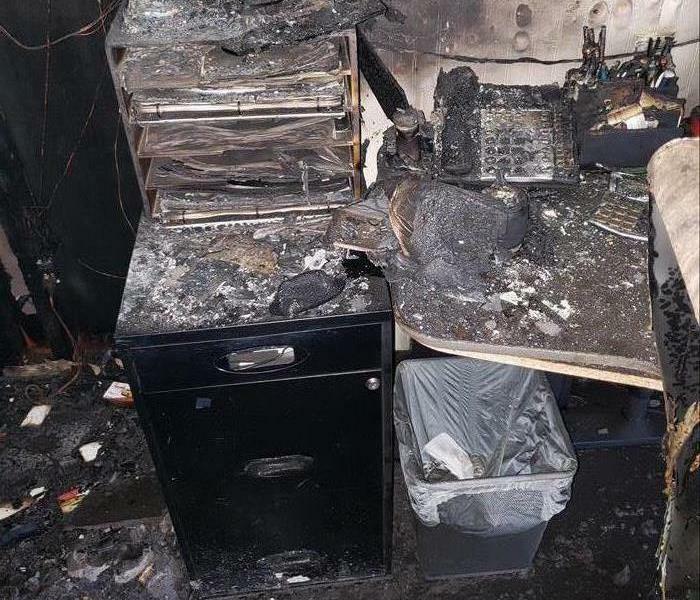 The fire affected the surrounding floor, melted the linoleum and scorched the walls as well as items kept near the water heater. We cleaned much of the scorching and removed water damaged material resulting from the fire rescue so that the area could be as prepped as possible for the rebuild. 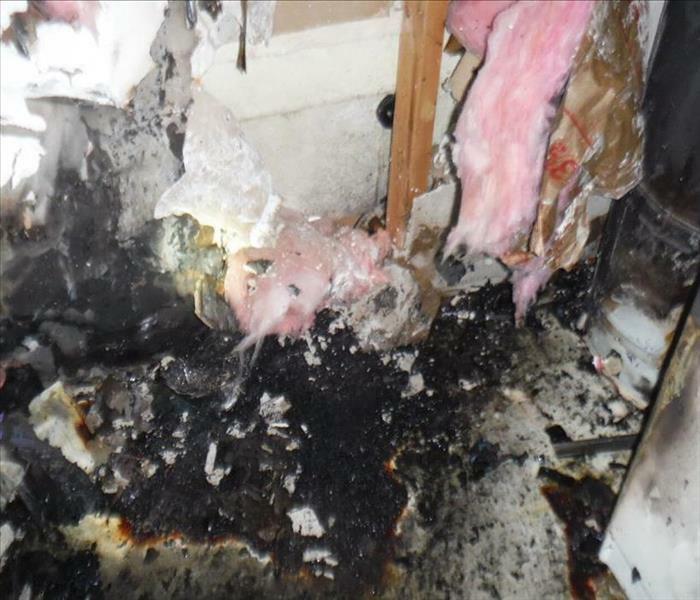 This was a good reminder of the importance of regular maintenance on our water heaters and to ensure that the area around the water heater is clear of any items that may be flammable or interfere with ventilation. A church in the Waco area called us out for a water leak and after inspecting the damage, we found this to be one of the sources. It appeared that a rodent in looking for something tasty, instead received a surprise shower and caused the flooding of the building. Once we determined the source, our technicians were better able to investigate where the water traveled and where insulation may have become wet. When insulation becomes wet, it loses its R-factor, its ability to resist heat. Because the line was located in the attic, the insulation nearby was wet and had to be removed. Fortunately, SERVPRO® of Greater Waco was contacted early on so further damage such as mold and ceiling collapse was avoided. 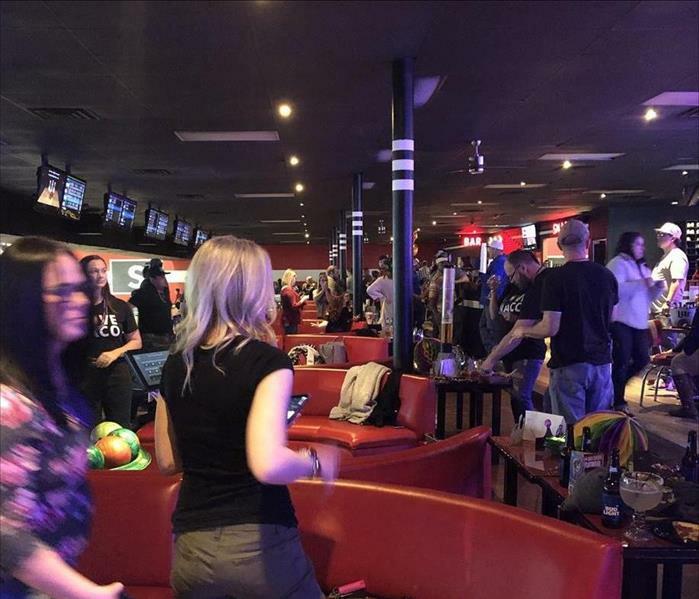 We were glad to sponsor a lane for the Mardi Gras 2019 PAC Bowling Tournament held on February 22 as a member of the Heart of Texas Apartment Association. We enjoy supporting an organization that brings together industry leaders for entertainment coupled with education. 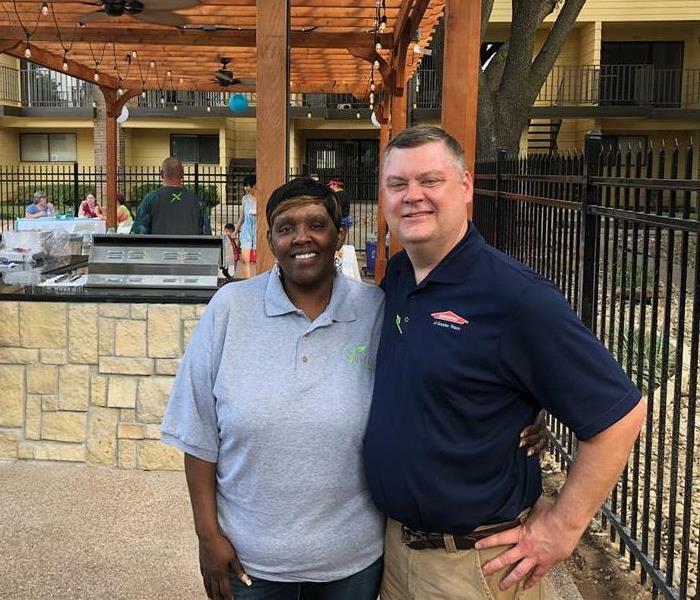 As a member of the Heart of Texas Apartment Association, SERVPRO® of Greater Waco is able to network and connect with the community and promote other local businesses. 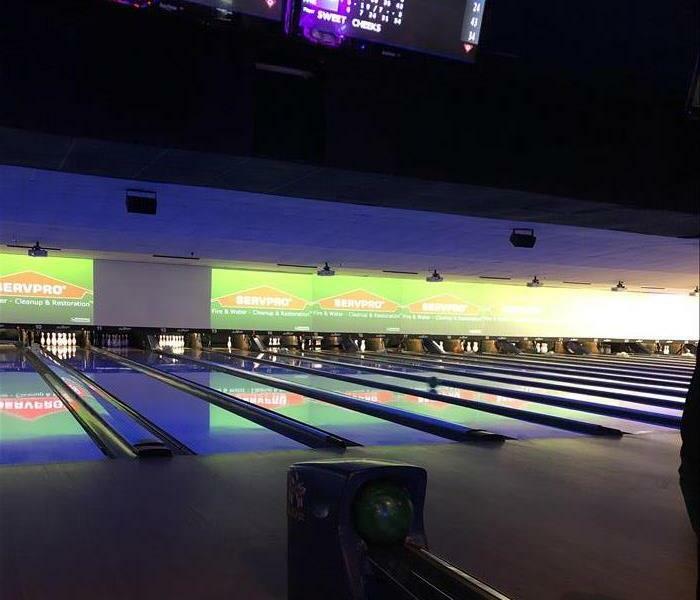 For the Mardi Gras 2019 PAC Bowling tournament, we were also able to sponsor a lane for the night. 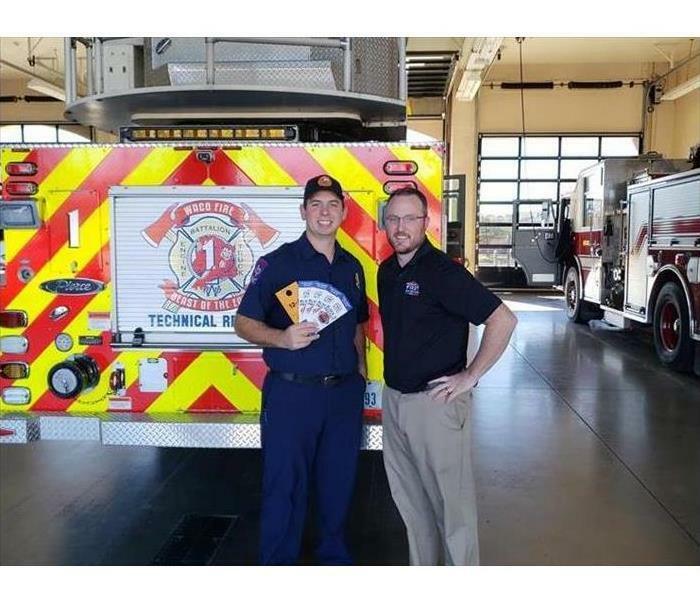 SERVPRO® of Greater Waco was honored to be able to sponsor one of Waco Fire First Responders to attend the SERVPRO® First Responder Bowl in Dallas, Texas that was held on December 26, 2018. When you are 16 feet up in the air, dropping ceilings, safety is of the upmost importance. Equipped with fall protection harnesses as required by OSHA, not even the heat could keep us from completing the job safely. When you have a water loss in your home, and you do not properly address it, there is potential you can create a perfect scenario where it rains inside your home. This is actually not rain, but it is condensation forming from the saturated air in your home. When you introduce large of amounts of moisture into your home and you do not allow that moisture to equalize by removing the access humidity. It is possible for the air in your home to reach condensation, or its dew point. 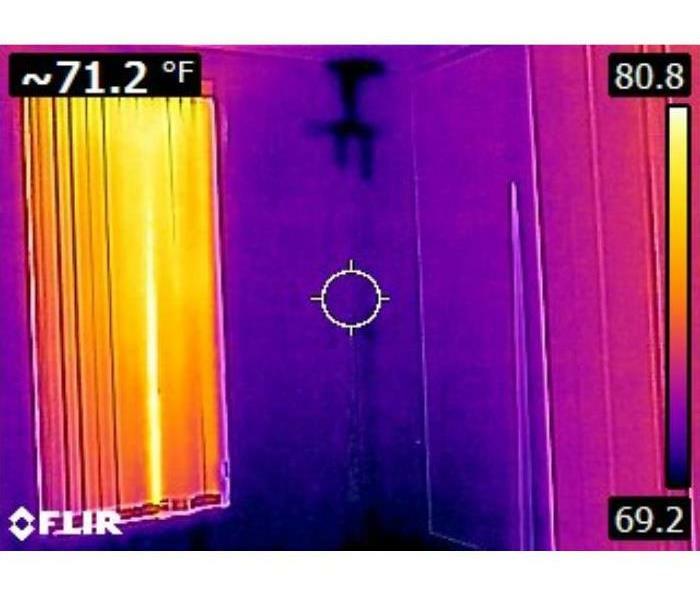 The experts at SERVPRO® of Greater Waco are certified in thermodynamics and the characteristics of water. We will address the loss in your home appropriately as to ensure that it does not rain in your home. The photo above is an example of a Waco home that did not properly address the initial loss; which created a secondary loss resulting in more thing in the home getting saturated with water. 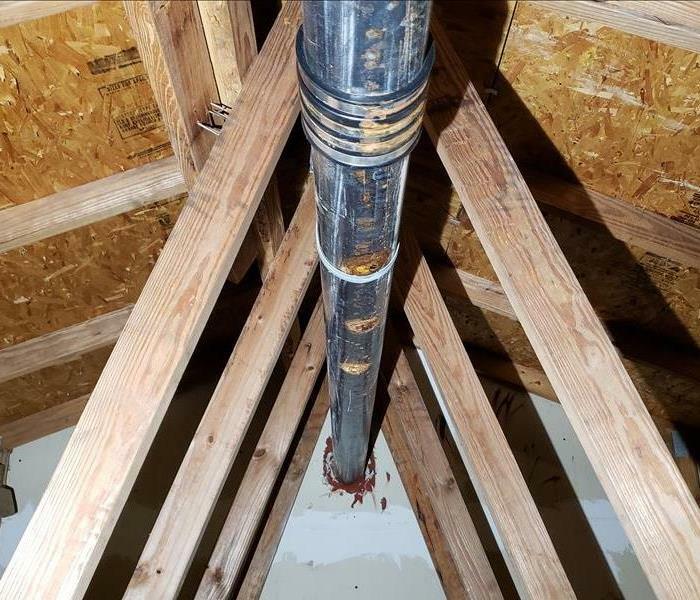 This photo was taken in a Woodway home that suffered a water loss where the homeowner attempted to remediate the loss themselves. They used a shop vacuum and some box fans to save themselves from filing a claim. 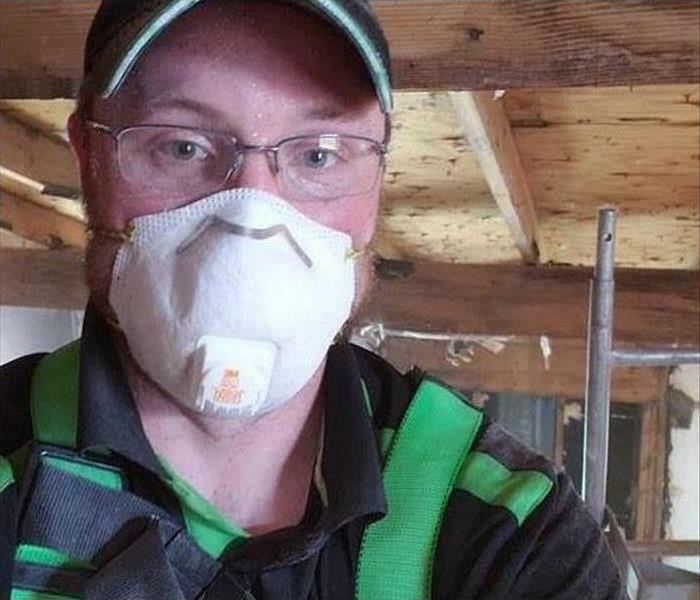 A few days later a musty smell began to linger and eventually the homeowner called SERVPRO® of Greater Waco. The length of time increased the damage to the home and actually allowed mold to grow in the corner behind some furniture. Unfortunately, this extra time that allow the mold growth also meant that the insurance company would not cover the areas affected by mold. 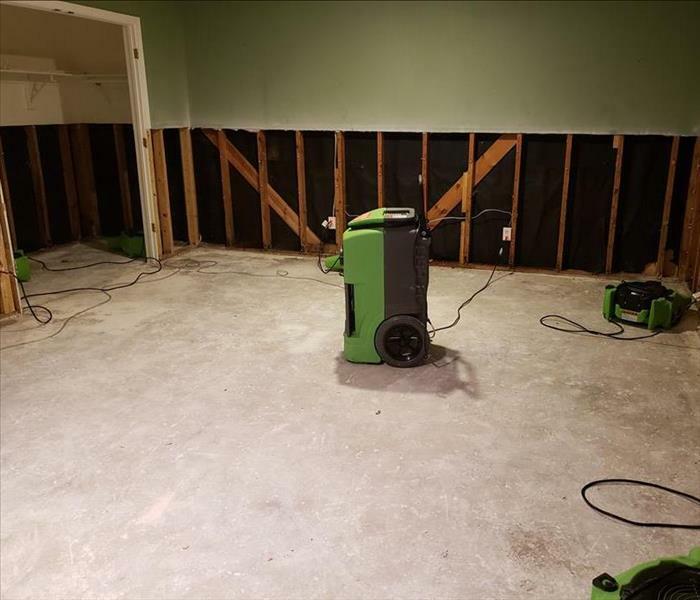 When you have a significant flood in your home, make sure to call the professionals like SERVPRO® of Greater Waco quickly to ensure that we can minimize the water’s affect on your home. Unfortunately, this home in Bellmead suffered a crawlspace pipe break. By the time the issue was discovered and repaired almost two weeks hag gone by making this loss a Category 3 situation. Our Crews had to wear full Personal Protective Gear (PPE) throughout the job. The Vinyl floor that had been installed in the home by its previous owners covered up some beautiful 1950s ear oak hardwoods. 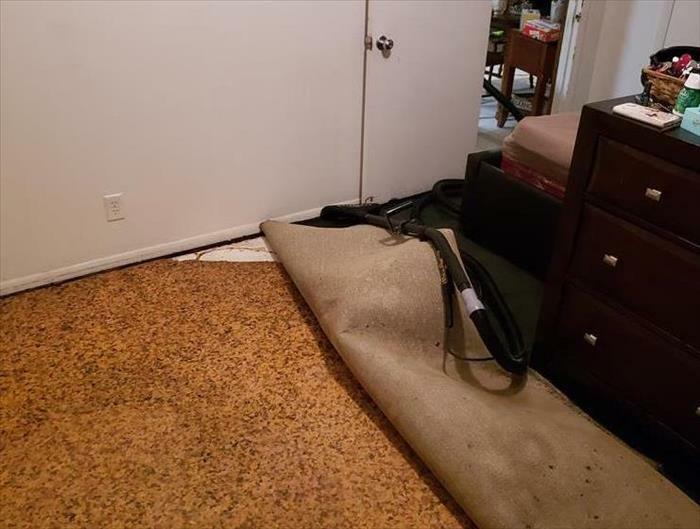 The vinyl, which is a moisture barrier, trapped the water below itself and ensured the hardwood floors were completely saturated and had to removed due to length they had been saturated. 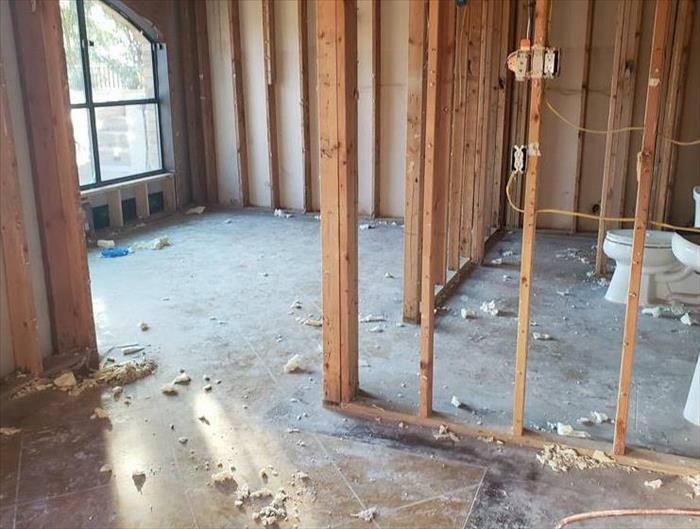 SERVPRO® of Greater Waco removed the saturated Category 3 materials and completed the dry out in the home, leaving it ready for the customer to begin the build back phase. While commercial buildings can differ greatly in construction, they often suffer the same type of water losses as homes. The mitigation approach might differ, but the same customer centered approach is applied to every job by SERVPRO® of Greater Waco. 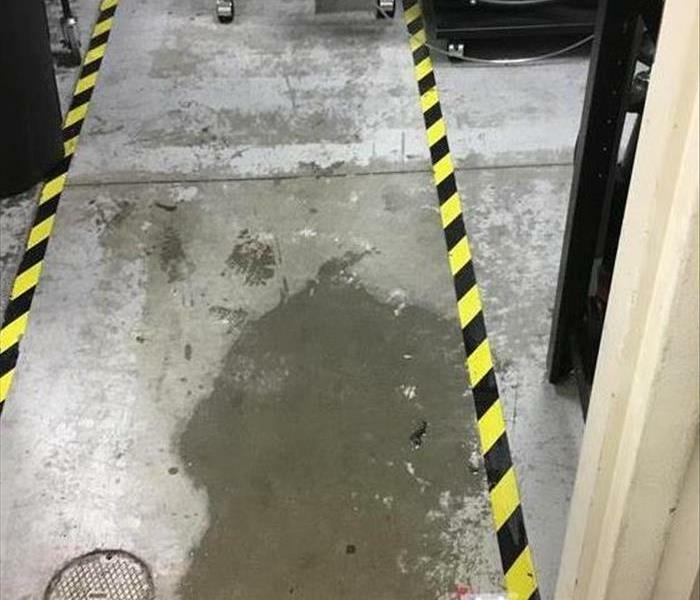 This store suffered a sewage back up from clogged pipe. 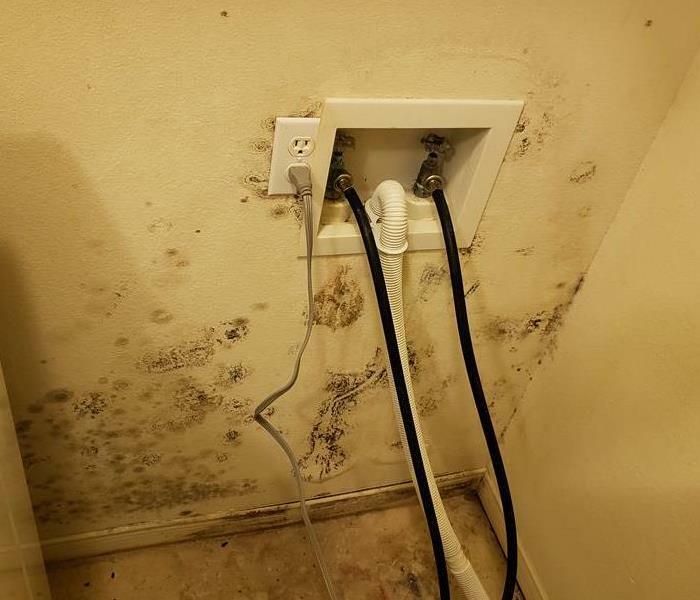 SERVPRO® of Greater Waco was called in to extract the standing water, to clean the affected areas, dry down the structure, and to deal with the pungent smell. SERVPRO® of Greater Waco's fast response helped minimize the down time the store experienced due to this unfortunate sewage back up. SERVPRO® of Greater Waco was onsite at a local apartment complex to address the damage resulting from a lightning strike during a thunderstorm. While our technicians were there a secondary fire began to smolder. A quack call and Waco's finest arrived quickly to put it out. 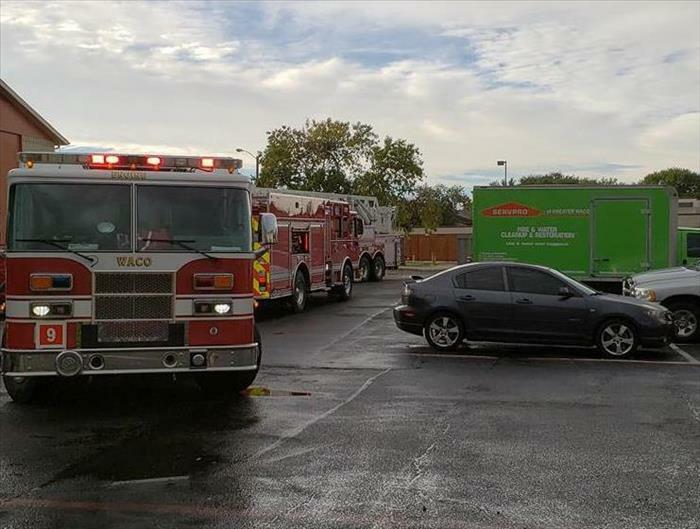 SERVPRO® of Greater Waco's employees safely alerted the tenants and stepped back allowing the Waco Fire Department to do what it does best. What's behind your office walls? This stair case and outside wall to the second level of a Woodway commercial building suffered a toilet overflow. SERVPRO® of Greater Waco had to remove the sheetrock on the wall due to the insulation behind the drywall being affected by water. 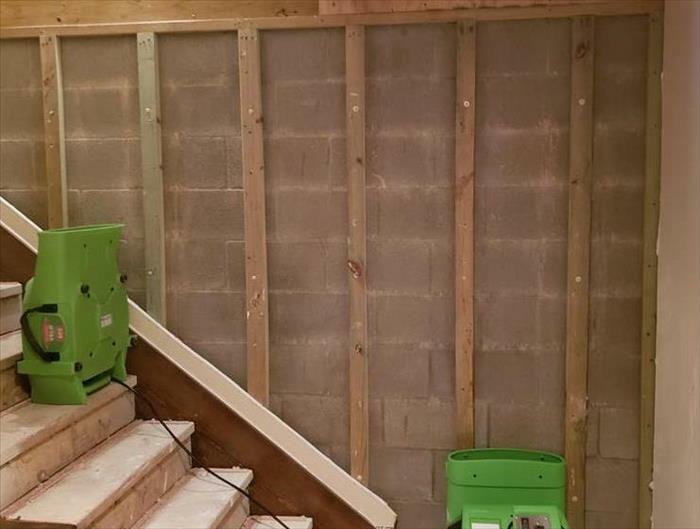 SERVPRO® of Greater Waco removed the drywall, the wet insulation, and dried out both the wood studs and the concrete masonry unit (CMU) wall. 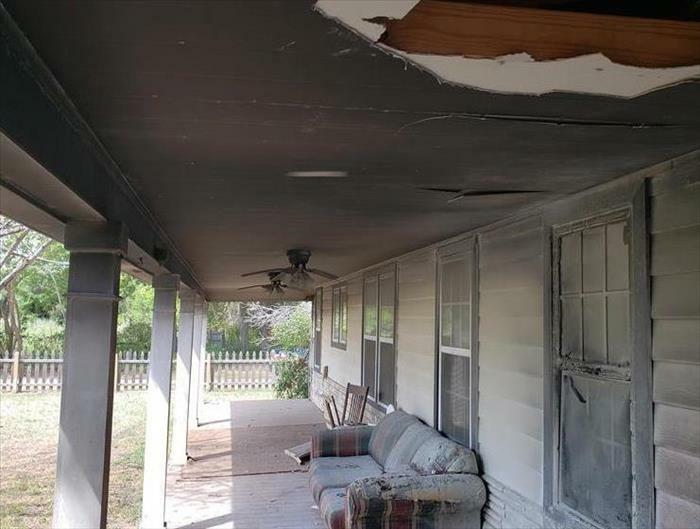 A cigarette ignited a cloth chair on the porch of this home. 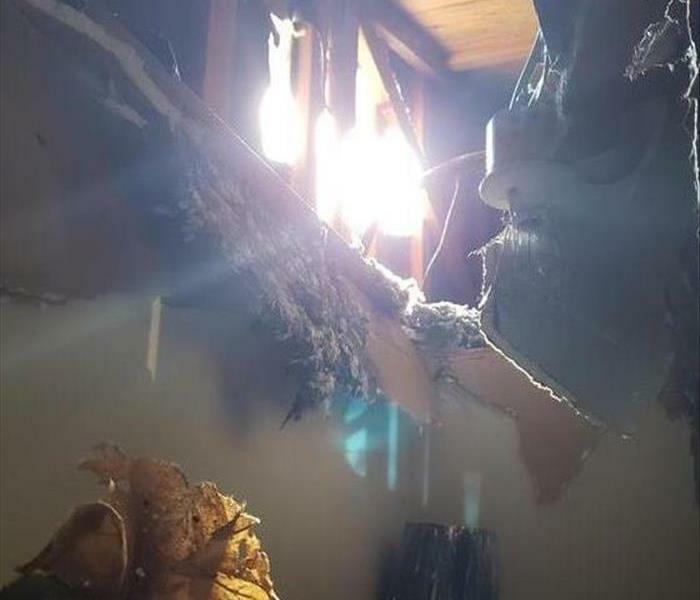 The front door was left open while a fire extinguisher was retrieved which resulted in the inside of the home being affected almost as bad as the porch in this photo. Even if a fire occurs across the street, not properly keeping your home sealed can lead to a severe smoke damage in your own home. This Waco apartment suffered an electrical fire. While the damaged caused by the fire was extensive, the local Fire Department had to ensure the structure was safe and that no secondary fires would start. They put out the flames, and wet all affected areas to ensure there was not another issue in the future. 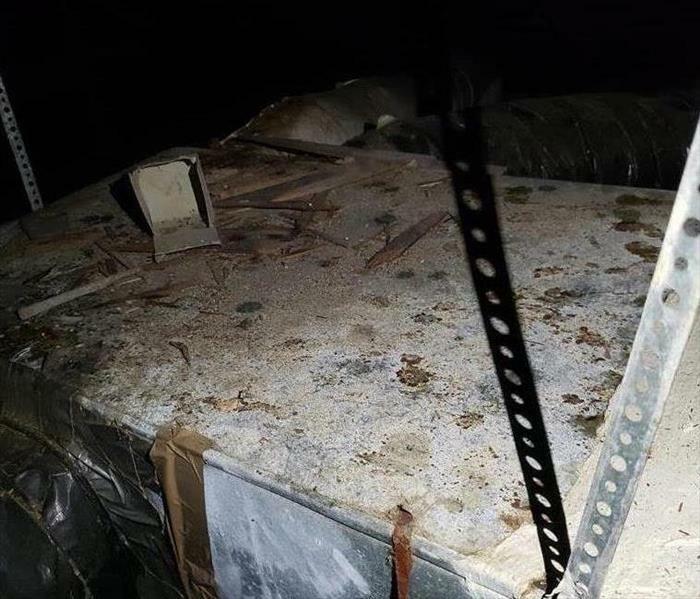 SERVPRO® of Greater Waco was called out to repair the hole in the roof temporarily, tarp the roof, and to deal with the resulting water damage and fire clean up. Is this Mold in the A/C return? SERVPRO® of Greater Waco was called to look at some mold growth in the return area of an HVAC system. When we arrived, the customer stated they had sprinkled the “mold” with baking powder to kill it. SERVPRO® of Greater Waco vacuumed the baking powder and the visible surface mold with a HEPA filtered vacuum and was able to treat the affected area with a mold control treatment spray. 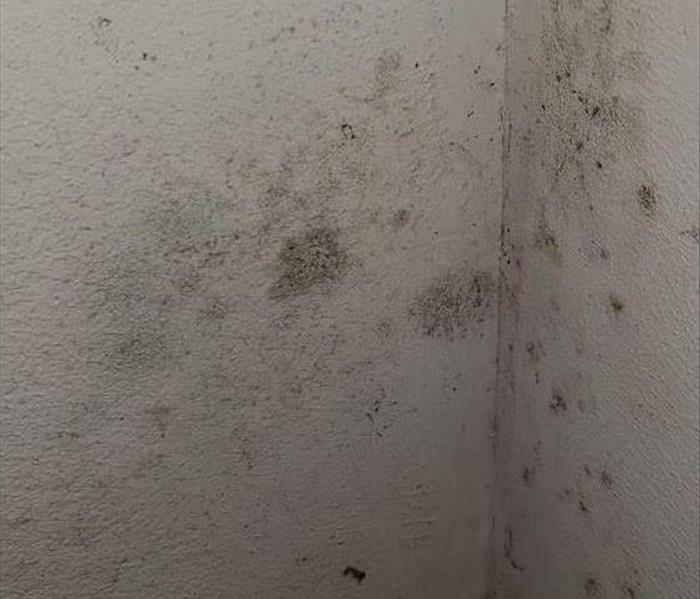 While the square footage of mold was very small, the customer mistook old water stains for mold growth. In the end SERVPRO® of Greater Waco addressed the issue and eased the mind of the homeowner. Does My Crawlspace Have Mold? While it is not surprising for a crawlspace to have some small spots of mold growth in it, once it is discovered you need to address the source of the mold. There can be many contributing factors that aid in creating an environment for mold to grow. If you do not remedy the cause of the issue time will only allow that problem to grow, sometimes exponentially. 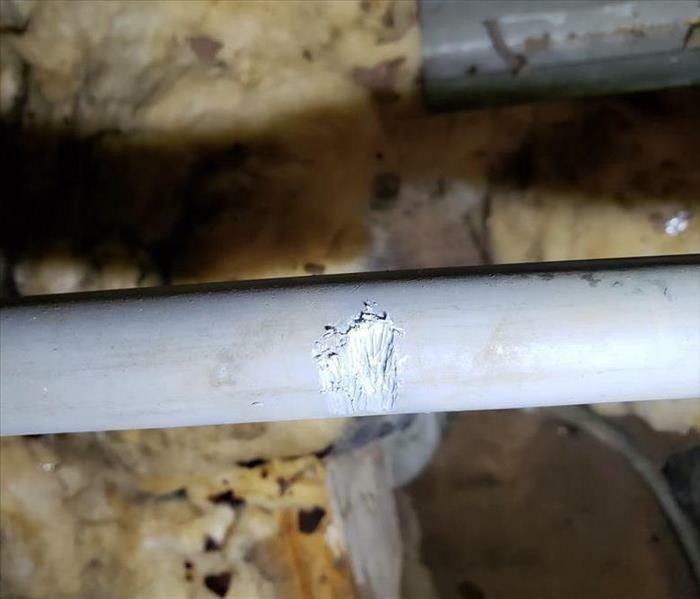 This Waco home’s crawlspace had a pin hole leak in a water pipe that was lightly spraying on the underside of the subfloor. After the water pipe was repaired, SERVPRO® of Greater Waco was called out to dry the area and to treat the mold.. When carpet padding is removed. This is a photo from a home that had a sink overflow while the owners were out of town. They came home to about an inch of water in their home. SERVPRO® of Greater Waco was able to extract and clean the carpets however, the padding under the carpet had to be removed. SERVPRO® of Greater Waco technicians were able to keep all the furniture in the room while they removed the pad by manipulating it around the room as needed. Even though this home only had an inch or so of water on the floor, the natural cedar walls sucked up, wicked, the water almost 8 inches in places. The longer water is allowed to sit on the floor, the greater the probability more damage is occurring. While wood walls are easy to see when they are wet; water in typical sheetrock walls with trim and paint is not so easily seen. SERVPRO® of Greater Waco has the appropriate tools to survey your home to see just how wet all your surfaces are. This home was flooded with less than 6 inches of water from a rising river. 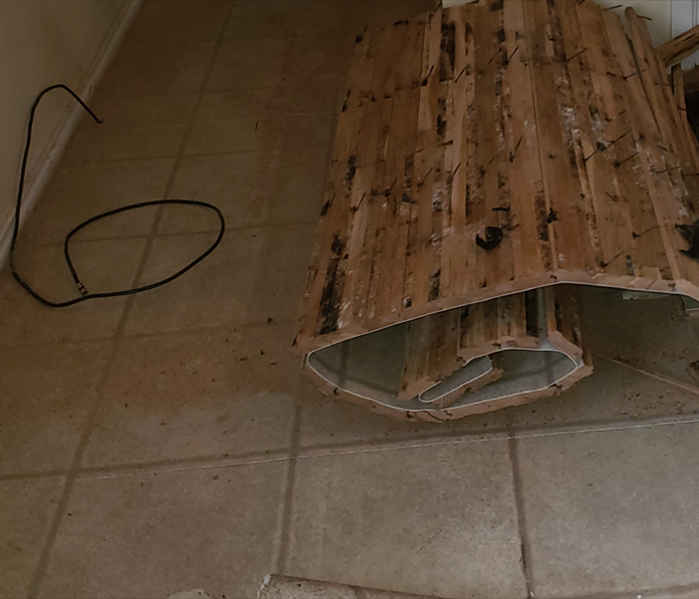 For SERVPRO® of Greater Waco to ensure the home would be safe for the homeowner, all the hardwood flooring plus 1 foot up the wall had to be removed. Flood water is Category 3 water, which is grossly contaminated, and it contains a myriad of harmful contaminants. SERVPRO® of Greater Waco takes pride in restoring homes so that they are safe to be rebuilt and occupied once again. While floods are devastating, having SERVPRO® of Greater Waco on their side is the peace of mind a homeowner needs. This home was affected by almost 3 feet of flood water. SERVPRO® of Greater Waco removed all wet porous material 2 feet above the water line. While the demo in the home was substantial, SERVPRO® of Greater Waco did not have to remove every bit of sheet rock in the home. SERVPRO® of Greater Waco takes great pride in doing a job right, and this job did not require that all the sheetrock be removed. A flood cut was made and everything below that line was removed, the remaining structure sanitized and properly dried out. This home was affected by 8 feet of rising water. 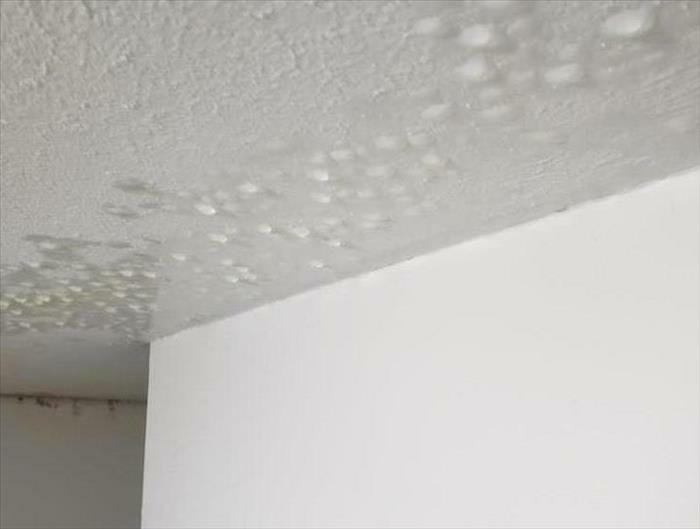 SERVPRO® of Greater Waco removed all porous materials down to the studs, sanitized the studs with an antimicrobial spray, and dried the structure to be ready for reconstruction. 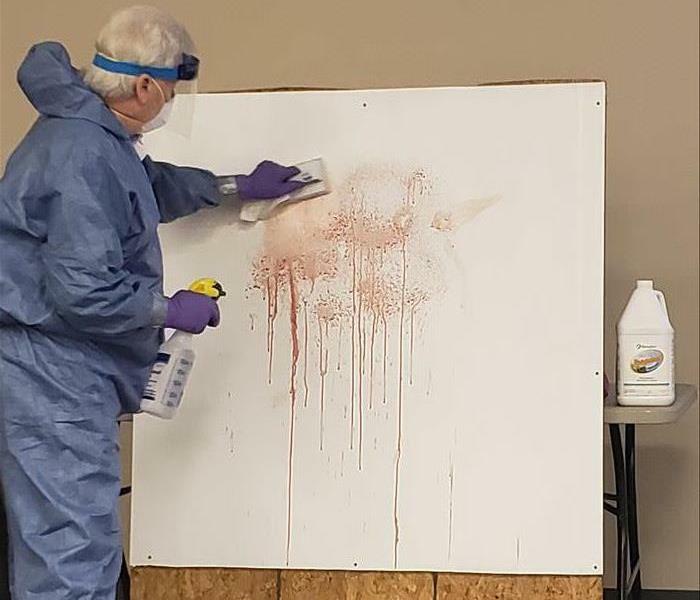 This photo was taken by our owner as he sat through a week-long Crime Scene, Trauma Clean-up, and Bio-Hazard course covering the proper procedures to remediate all those types of losses. Don't worry, the photo is just red dye and Bacon (everybody loves bacon!) used for demonstration purposes. While the class helped us lose our appetites, we are trained and ready to properly address any trauma scenes you might encounter. SERVPRO® of Greater Waco is your crime scene and trauma certified specialists. 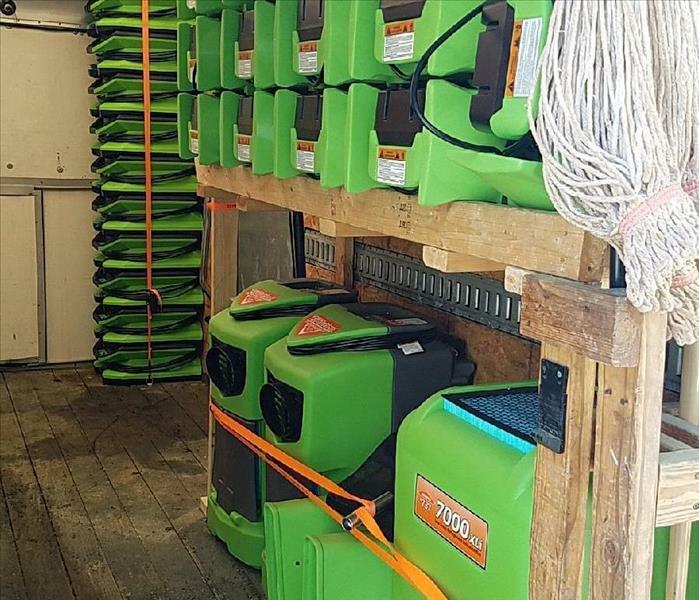 SERVPRO® of Greater Waco had the privilege of assisting those affected by the Colorado River flooding near Kingsland, Texas. Flood work is both a physically taxing task and a rewarding adventure. While the work is incredibly strenuous, this is when our technicians earn the title “SERVPRO® Heroes.” In this photo we completed a 4ft flood cut in a home that took on 3ft of water, we sanitized the remaining structure, and dried out the structure so it can be rebuilt. 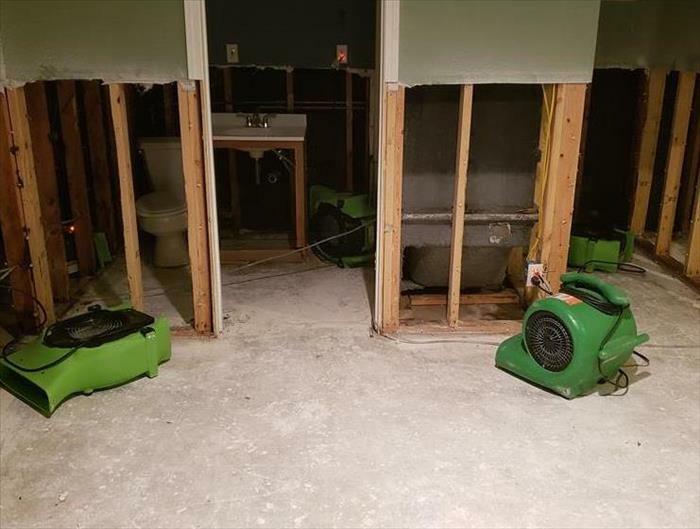 SERVPRO® of Greater Waco worked with FEMA and their NFIP coverages on several jobs while helping flood victims recover their homes. SERVPRO® of Greater Waco responded to this local Waco commercial fire. While the structure was a total loss, our professionals were asked to complete a contents inventory and to clean the few salvageable items from the fire. By providing this service SERVPRO® of Greater Waco is heling both the customer and the insurance carrier. By quickly inventorying what cannot be saved and cleaning what can; we are helping get the insured one step closer to their normal life. 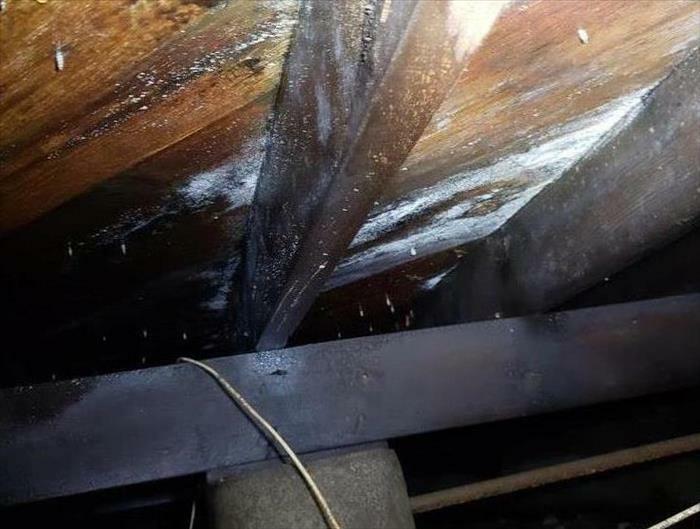 SERVPRO® of Greater Waco was called out to inspect a Waco attic after a tenant complained of a musty smell coming from their attic. After coordinating with the property management company as to the cause of the growth and a remedy, we were able to remediate all the mold in this attic within a few days. The best news was the tenant had nothing but great things to say about our services. SERVPRO® of Greater Waco is your local go to company for mold remediation. SERVPRO® of Greater Waco was called out to help dry out a Woodway medical facility after their 4 inch main pipe broke. SERVPRO® of Greater Waco responded within 15 minutes, and was able to minimize the area that could have been affected on this loss. 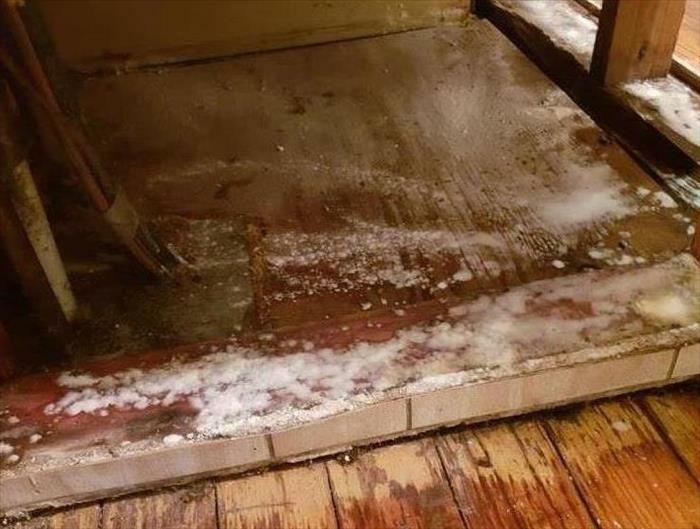 SERVPRO® had this property dry within 4 days and the residents felt "Like it never even happened." 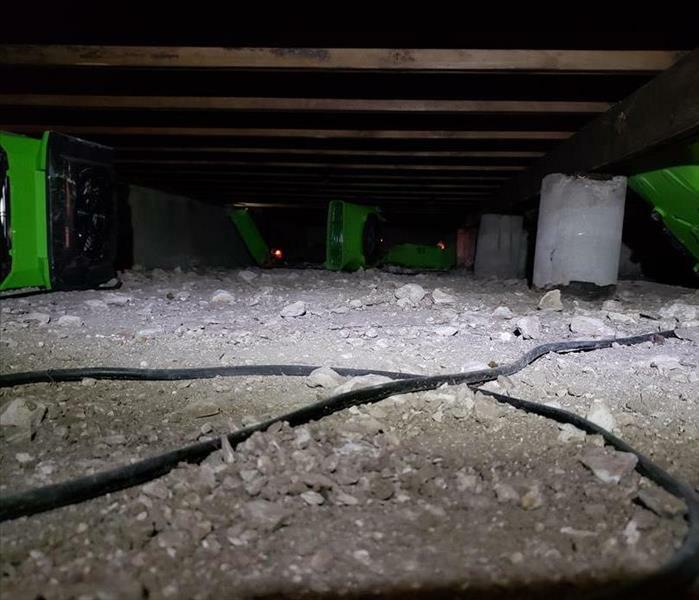 SERVPRO® of Greater Waco's technicians were called out to mitigate this crawlspace flood in Waco. We had to extract water from beneath the house before we could address the subfloor below and the wood floors that suffered a water damage on the main floor of the home. SERVPRO® of Greater Waco responded quickly to this crawlspace pipe leak. A small washing machine leak was not properly address and SERVPRO® of Greater Waco was called out to address the issue. Failure to properly address any leak in a wall can cause significantly more damage if it is allowed to sit untreated. SERVPRO® of Greater Waco was in attendance when a local property held a grand re-opening. The local Waco area Chamber had a great turnout and cut the ribbon marking a new era for this property. SERVPRO® of Greater Waco is fortunate to partner with this property. 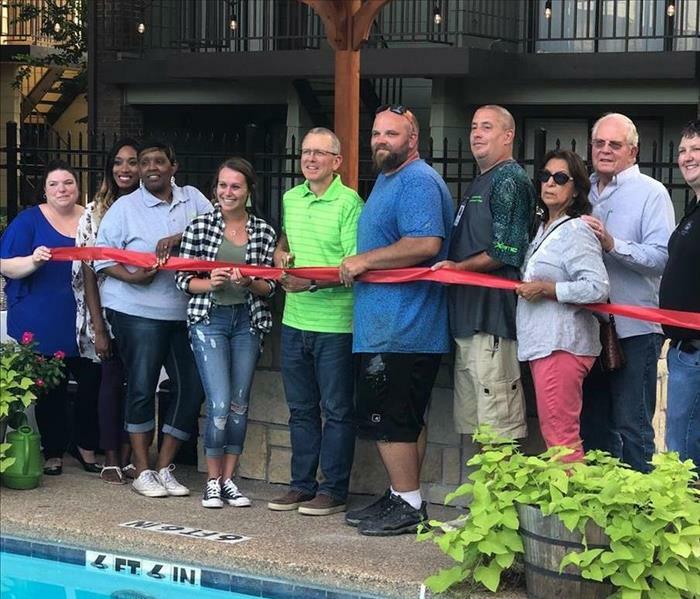 Ryan had a great time at the grand re-branding of a local Condominium complex. It is great to share in the successes of other Waco area business. SERVPRO® of Greater Waco is dedicated to helping other business stay in business. 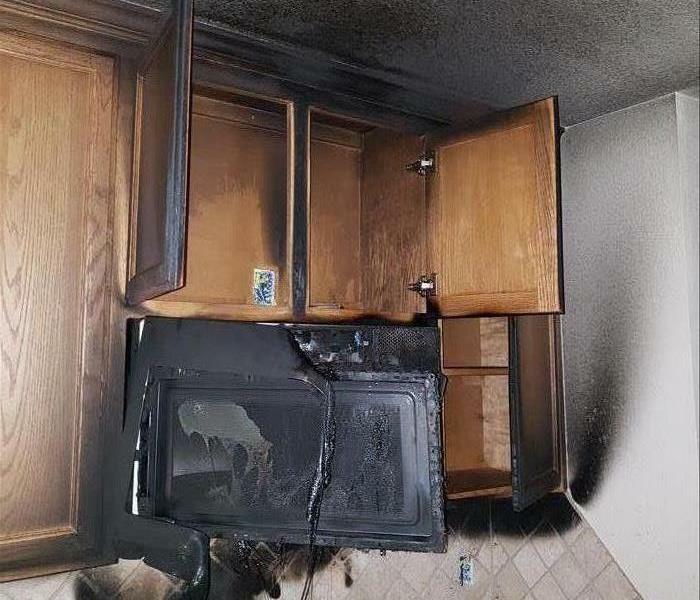 One of our Waco customers got distracted and forgot they were cooking on the stove until it was too late. 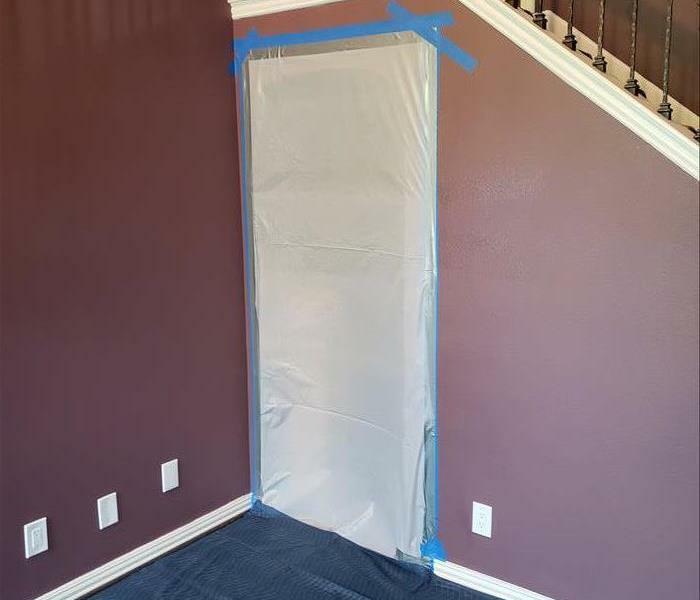 SERVPRO® of Greater Waco was able to come in the home and clean the area as a prep for paint scenario. This is a photo of the microwave that was directly above the stove. With years of experience we have expertly loaded our Box truck to ensure that everything we might need is always available to our crews to do the job right. SERVPRO® of Greater Waco is here to help.